From the Classroom: Does Anyone Have Any Questions? For years, whenever my students and I read a novel, I would pass out a study guide with a list of questions for each chapter. By giving students the study guide questions―questions I wrote―I could make sure that students wouldn’t miss anything in their reading. Too often, students would read too quickly and miss details. Requiring students to answer study guide questions was my way of getting them to slow down to notice what they were reading. To get them to see the dots that they could later connect together. After we finished the novel, the next step would be a writing assignment. On that day, I would pass out a list of essay questions. I often included questions of varying difficulty in order to better differentiate instruction, and students could happily chose whichever essay question was most accessible (or least terrifying). In case none of the questions interested students, I always gave them the option of creating their own essay question (just so long as they reviewed it with me first). Of course, rarely did students ever take me up on that option. After all, by creating essay questions for them, I had already sent the message that it was the teacher’s questions that mattered, not theirs. And while some students were more than happy to answer my questions―in fact, I think some of them preferred to―what I’ve come to realize that what I needed to focus on was getting students to answer their own questions about the text. Recently I’ve tried to find more opportunities for students to generate their own questions about the texts we read. Earlier this month, I had the opportunity to attend a workshop with Kylene Beers and Robert Probst on close reading strategies. One of the things that Kylene pointed out―and which she and Bob cover in their book Notice and Note―is the importance of getting students to engage in dialogic versus monologic questions and conversations. Monologic questions are those questions that, as the prefix implies, work in one direction: the teacher asks a question and the students answer. Often, the conversation stops because monologic questions tend to have one or a limited number of answers. While such questions can be valuable―for example, as a quick way to check for comprehension―the more important thinking happens when we make space and time for dialogic questions. Dialogic questions are about dialogue. Dialogic questions are not only open-ended, inviting multiple possibilities for response, but also require a back-and-forth conversation. Dialogic questions lead to more questions. While monologic questions may be confirmative (we ask monologic questions to confirm what students know or don’t know), dialogic questions are exploratory. 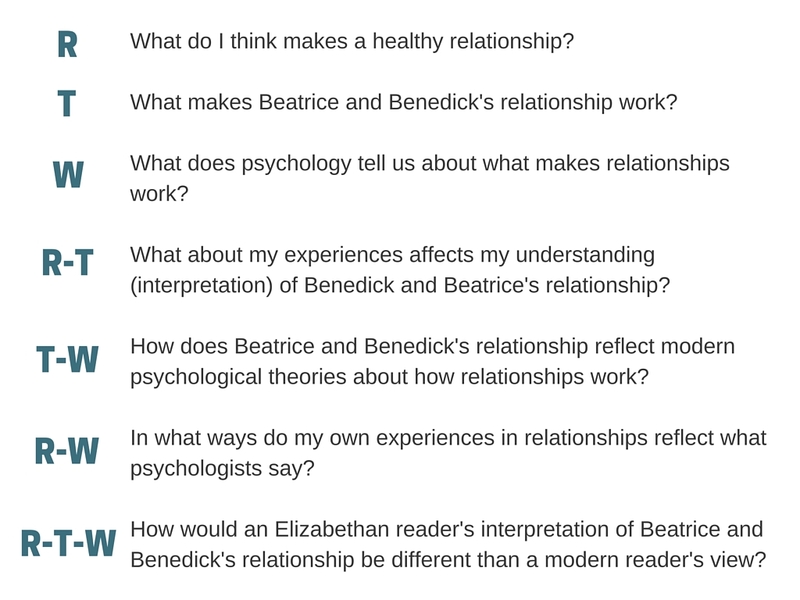 As Kylene and Bob spoke at the workshop, I reflected on my own use of monologic v. dialogic questions. And though I believe I do offer opportunities for both types of questions, I had to admit that I was still the one creating all the questions. As a teacher, I may be responsible for the conversations that happen in my classroom, but part of that responsibility is turning ownership of the conversation over to students. No matter how effective my own dialogic questions may be, for conversations to be authentic and meaningful and powerful, the questions have to come from the students. In In the Middle, Nancie Atwell reminds us that part of our jobs as teachers is “handover”―to give students opportunities to become more independent learners. So how can we create those opportunities? First, I had to learn to cut back. While I still handed out a study guide with some of the books we read, I cut back on the number of questions by at least half. I kept only the questions that I felt pointed to information in the text that was non-negotiable for students to know. Reducing the number of teacher-created questions was a first step, but not enough. I also had to make space for student-generated questions. Too often, we fear that student-generated questions won’t be the types of rigorous questions we, as teachers, would ask. And in my own experience, it was often easier for me to give students questions (and yes, sometimes the answers) than to take the time to teach students how to generate their questions. The only way for students to become more adept at asking good questions—questions that elevate and complicate their thinking–is to give them time and practice doing so. Rather than just focus on answering questions, we can also talk about the questions themselves—what makes one question better than another and why. Factual questions are verifiable, with answers found directly in the text. These questions ask students to go into the text and answer who, what, where, when, and how. Inductive questions are also verifiable, with answers found throughout the text. These questions ask students to look at multiple places within the text, to interpret the text, in order to answer the question fully. These questions focus on how, why, and so what. Analytical questions are those that connect the text to other texts, situations, or experiences. These questions ask students to go beyond the text and ask how the text is related or similar to the world outside the text. Recently, I’ve tried to develop students’ questioning skills further by having them develop their own essay questions. 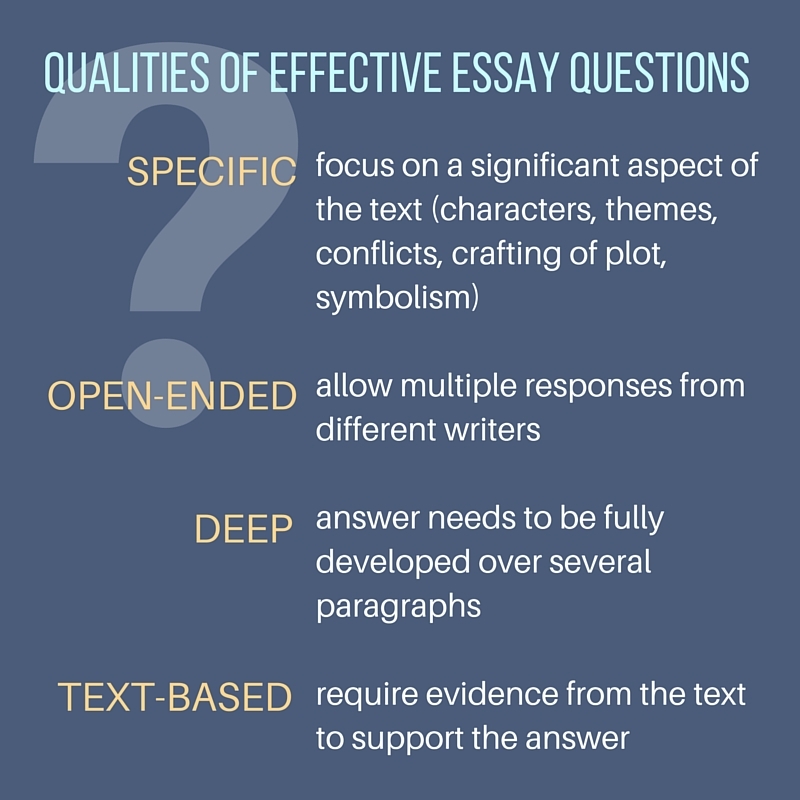 Effective essay questions, however, are more difficult than the questions students may write or ask during their reading. My students and I came up with some criteria on what would make an effective essay question, and together, we generated the qualities on the right. As you can see, these criteria naturally build upon the levels of questioning that Burke discusses in What’s the Big Idea? Still, while these criteria were helpful, for students who didn’t have practice generating their own essay questions, the criteria were not enough; students still needed additional scaffolding. And that’s when I came across Questioning Circles, developed by Christenbury and Kelly (1983) and discussed in the NCTE text Whose Inquiry is it Anyway? as well as Jeff Wilhelm’s Engaging Readers and Writers with Inquiry. 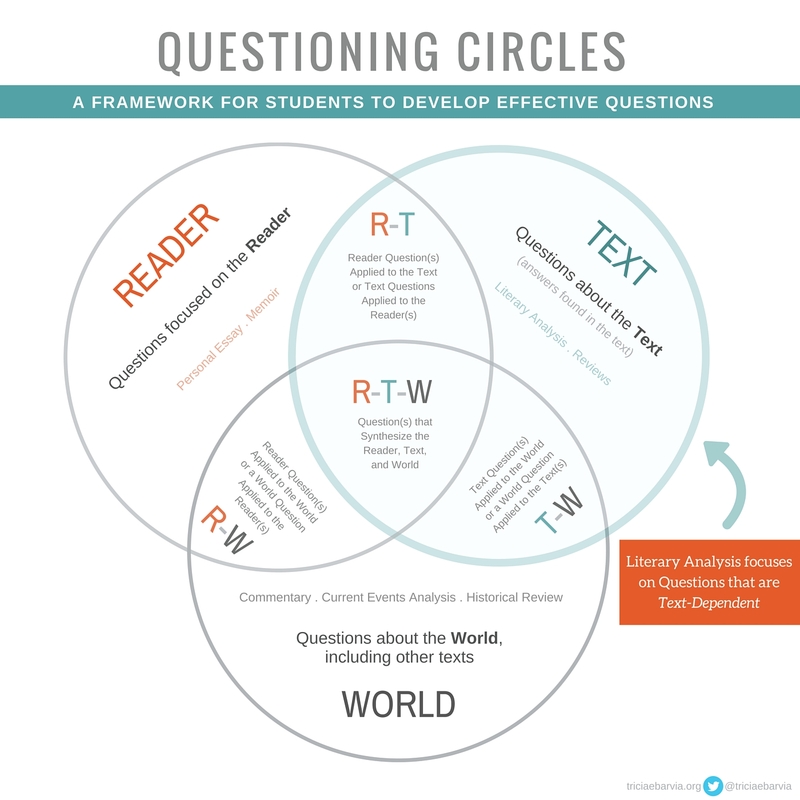 As you can see in the diagram above, Questioning Circles show students the relationship between the text, the reader, and the world—and more importantly, how reading is a complicated process that can engage all three elements. Asking students to consider the multiple types of questions that arise when reader, text, and the world intersect can open up students’ thinking about texts and their power to teach us about ourselves as readers and the world in which the text exists. What I appreciate about the Questioning Circles model is that it clearly shows students the importance of looking at text from a variety of viewpoints and validates those viewpoints. After students brainstormed questions for each category, we then discussed which questions would make effective essay questions. Because we had already established that effective essay questions had to be text-based, students could see that only the four types of questions within the Text circle (the light blue shaded area) would work for their essays. Together, students revised their questions and began the work of writing. Does anyone have any questions? In the past, it’s a question I would ask students every day, at least five times a day. I usually asked to check for understanding, especially if I’d just explained the details of an assignment. And not surprisingly, most of students’ questions then tended to be about due dates and formatting questions―useful questions, of course, but not the types of questions that will be important in the long-term. Thus, every opportunity students get to ask their own questions, and to use those questions to extend their thinking in writing, is an opportunity for handover, as Atwell reminds us—to handover learning to students. When students know that their questions matter, they learn to listen to their inner “reader’s” voice rather than depend on the all-knowing teacher one whispering in their ear. Making the space and time for student-generated questions is an important step toward an inquiry-based classroom. Now, instead of asking if anyone has any questions—yes or no—we can shift to asking students What questions do you have? Do you happen to have a blank copy of the model that you could share for the Questioning Circles? Perfect!!! Questions/Questioning and how we approach who asks the questions and what kinds of questions are asked is an important discussion topic in my undergraduate methods class. I plan to read your blog post with my undergraduate methods class next week — I will project the post and we will respond in class and on-line. Thank you, as always, for sharing your expertise. What an important distinction between asking “Does anyone have any questions?” and asking “What are your questions?” I think that you’ve made it clear how shifts in our language go hand-in-hand with shifts in our thinking about our teaching, and lead to deeper thinking on the part of our students. Thanks for a thought-provoking post! You are so thoughtful in your teaching. Your students (and your own children) are so lucky to have you! I love how you work to make learning about the students growth, not always just about the material. This will allow students to learn to be curious, but more importantly, to be self-assured.